Cut larger tomatoes into slices and smaller tomatoes into halves to make regular sized tomato pieces. Coat in olive oil and reserve until required. Rub flour, butter and salt together until a sandy texture is achieved. Lightly beat the egg with the marmite and add to the flour mixture along with the polenta. Combine all the ingredients together to make a dough. On a lightly floured surface roll out the dough until about 1 cm thick. Using a ring cut out a disc shape and transfer to a baking tray. Rest in the refrigerator until firm, about 30 minutes. Preheat the oven to 160 ˚C. Peel and thinly slice onion. Pick thyme leaves discarding the woody stems. Melt the butter in an oven proof pan, add onion and thyme and stir to combine. Place a lid on the pan and transfer to the oven and cook until the onions are soft but have no colour, about 10 minutes. Return pan to the stove top, remove lid and continue to cook until dry. Add honey and mustard and season to taste. Allow to cool and reserve until required. Increase oven temperature to 170 ˚C. Prick the dough using a fork and blind bake for 10 minutes. Allow to cool. Increase oven temperature to 180 ˚C. Spread the honey and mustard onions over the blind baked tart base. 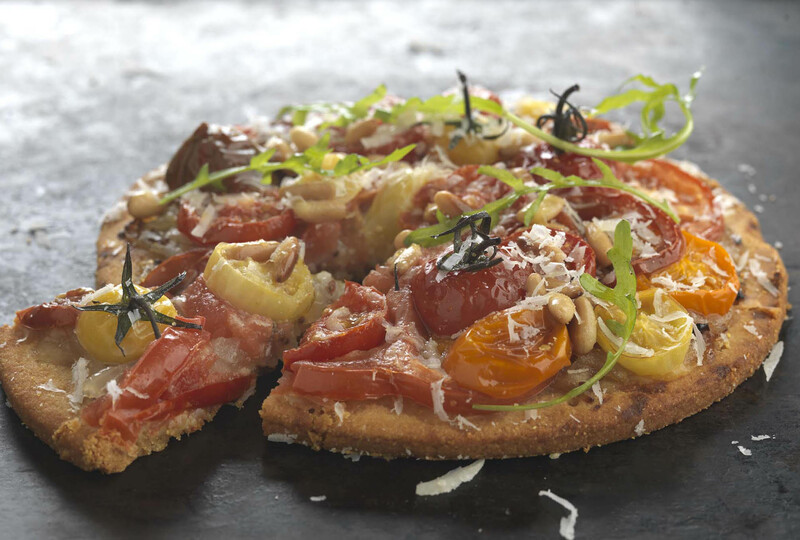 Arrange slices of tomato on top and sprinkle with pine nuts. Bake until the tomatoes are cooked and start to take on some colour, about 8 to 10 minutes. Allow to cool slightly and top with fresh rocket and grated Parmesan. Favourite summer tipple by excellence, Rosé wine is a no brainer when considering a wine to have with tomato. The combination of ripe red berry fruit within the freshness of Rosé seems to handle the sweet and sour flavours of the tomato perfectly. The Bandol Rosé, Domaine Tempier from Provence, France 2014 vintage has enough structure to cut through the crunchy texture of the polenta pastry. The wine’s pungent mix of herbs, spices and pink grapefruit will not be overpowered by the honey and mustard onions. This example is from the famous Provence region but as long as they are not too lean and acidic most pink wines should be up to the task.